HARTLAND QUAY & HARTLAND POINT – The coast around Hartland Point is one of Britain’s most treacherous. At least 36 ships were wrecked on the 4 miles centred on Hartland Quay alone between 1800 and 1920. There is a small museum and six circular walks start from the museum. The beach at Hartland Quay is rocky with numerous pools and the cliffs are spectacular with contorted rock formations. There are lovely views from Hartland Point although you are unable to access the beach below. WESTWARD HO! – A seaside resort with all the features one expects – amusement arcade, putting green, playground, beach shops, snack bars and seaside pubs. 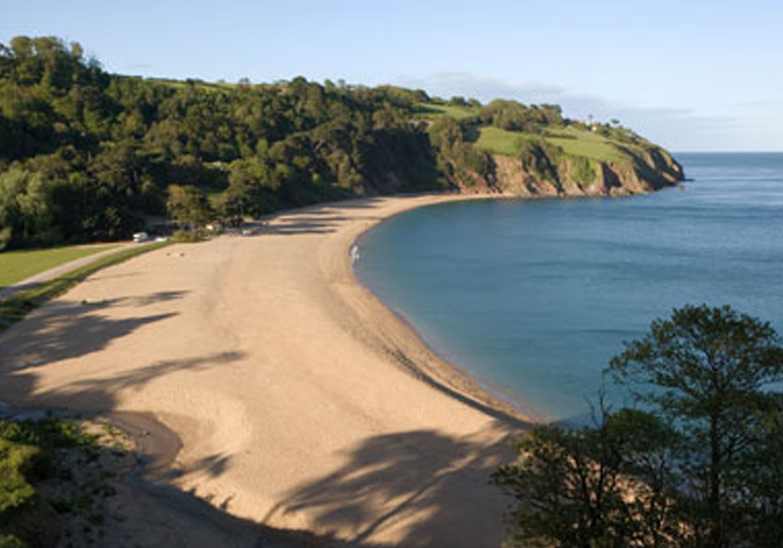 The beach – sand/pebbles – is easily accessible from the car park and is ideal for swimming and surfing. There are also pools in the rocks which have been adapted for swimming and seawater swimming pool. Nearby are Appledore, Bideford, Northern Burrows and the Royal North Devon Golf Club. 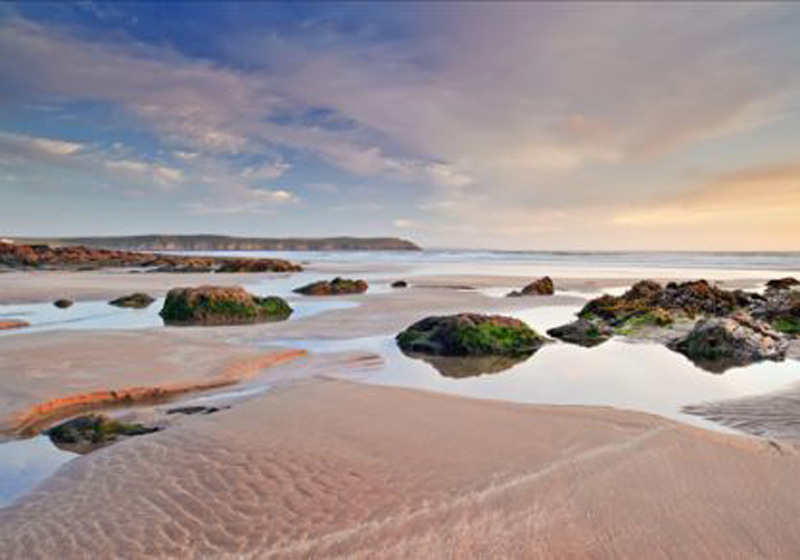 CROYDE – This award winning sandy beach is just around the corner from Saunton Sands. There is plenty of car parking and it is excellent for swimming, surfing, windsurfing etc. The beach is manned with lifeguards. At one end of the beach there is equipment hire, a shop, refreshments and toilets. PUTSBOROUGH – (At the southern end of Woolacombe Sands) Another award winning sandy beach manned with lifeguards. Again ideal for surfing, swimming and water sports. There is a beach car park, toilets and a snack bar. SAUNTON SANDS – 3 miles of fantastic sand backed by massive sand dunes. An excellent surfing beach and ideal for all water sports. Manned with lifeguards. Shop and toilet at car park end of beach. Advisable to arrive early in the summer as car parking space is limited. WOOLACOMBE – A modern settlement rather swamped by hotels guest houses and caravan parks. However once you get past all this you come to one of the finest beaches in the West Country. Three miles of golden sand with numerous awards. It is very clean and tidy, has good toilet facilities, first aid, life saving equipment and even a lost children service. There is a large car park near the beach. Woolacombe is ideal for all water sports and there are lifeguards on the beach. However attention should be paid to warnings not to bathe at low tide. BARRICANE BEACH – (Just north of Woolacombe Sands) A Small rocky cove with a beach made of broken sea shells. Lots of rock pools amongst the flat rocks which kids will love. Parking is on the Mortehoe Road (opposite The Devon Beach Hotel) or at Woolacombe Beach car park five minutes walk away. COMBESGATE, ROCKHAM & GRUNTA – Small secluded bays which have deep safe rock pools. The only access to these bays however is by footpath. A good starting point is the ancient parish church at Mortehoe – St Mary’s. TUNNELS, ILFRACOMBE – The Tunnels are passages hewn through the cliffs to a privately owned bathing beach. The Victorians also built up walls between rocks to make two bathing pools. One for ladies and one for gentlemen. There is a small charge to use the Tunnels. LEE – This pretty little village is nestled in Fushia Valley which is a deep combe where fushias grow in abundance. The beach is delightful at low tide with lots of rock pools to explore and a stretch of sand giving good bathing. 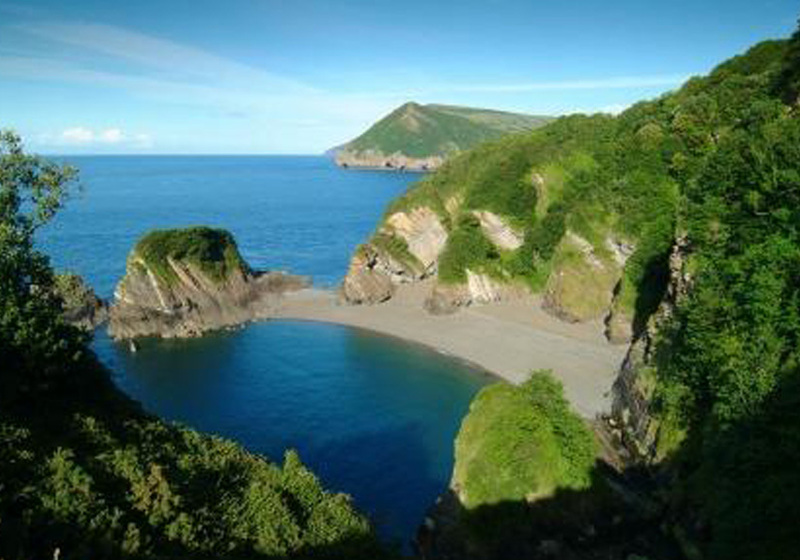 HELE BAY – (Just east of Ilfracombe) A safe shingle beach which is popular with canoeists. There are a few amusements and a tide filled children`s swimming pool. In the village is a working 16th century watermill open from April through to October.